The location near the turtles, and (!) the smooth organization of the tours/turtle viewing!! The turtle experience was awesome and worth every discomfort. The hotel is basic and seems overpriced at first, but when you add in the two turtle tours it made it worth it. The morning tour was best. Though it was not turtle season, we still had six turtle encounters. Restaurant was good. Staff were friendly but lacked some English at the reception. We came for the turtles and they were amazing. December is low season but we saw mommas and babies, both on the evening and morning tours. The only good thing about this hotel is the turtle watching tour that you could book without even staying in the hotel... making the hotel stay a rip-off if you remove the turtle tour from it. The property sits at an absolutely good location. 10min walk can get to the beach where turtles nest and hatch babies. The dinner and breakfast are very tasty and good value for money. Highly recommended. 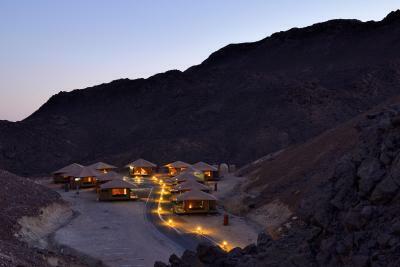 Located in Ras Al Jinz, the nesting site for green turtles, Ras Al jinz Turtle Reserve offers air-conditioned rooms and cottages with a flat-screen satellite TV. It offers a free private beach area. 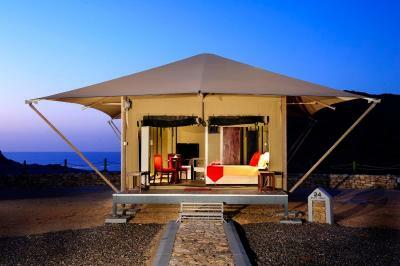 All accommodations at Ras Al jinz Turtle Reserve features a warm décor. Each cottage is located on a hillock. The private bathroom is fitted with a shower and free toiletries. There is a restaurant which offers traditional food. A breakfast buffet is served. The 24-hour front desk provides free luggage storage and a safety deposit box. Ras Al jinz Turtle Reserve provides guided tours for viewing the green turtles. The city of Sur is 25 mi away. This property also has one of the top-rated locations in Junayz al Janūbī! Guests are happier about it compared to other properties in the area. This property is also rated for the best value in Junayz al Janūbī! Guests are getting more for their money when compared to other properties in this city. 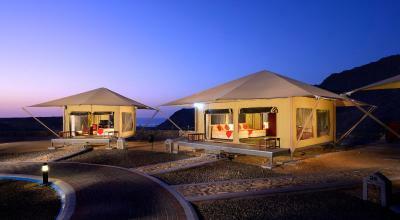 When would you like to stay at Ras Al Jinz Turtle Reserve? This air-conditioned room includes a mini-bar, a flat-screen satellite TV and a wardrobe. A shower and free toiletries are fitted in the private bathroom. Located on a hillock, this air-conditioned cottage includes a mini-bar and a flat-screen satellite TV. A shower and free toiletries are fitted in the private bathroom. Located on a hillock, this spacious, air-conditioned cottage includes a mini-bar and a flat-screen satellite TV. A shower and free toiletries are fitted in the private bathroom. Ras AI Jinz is a fishing village located in the Ras AI Hadd, on the eastern shores of the Arabian Peninsula. The Ras AI Jinz beach is world renown for the nesting endangered green turtle (Chelonia mydas), probably the most important nesting concentration on the Indian Ocean. This is the only official place where the public can watch the nesting process of these amazing sea giants. The Turtle Reserve was established by Royal Decree in 1996. The Ras AI Jinz Turtle Centre, a truly eco-tourism project, was established in 2008 to help conserve the fascinating and amazing nesting processes of these giants of the marine turtle world. 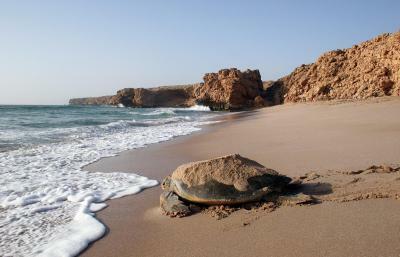 One of the most popular eco-tourism activities in Oman is turtle viewing. Oman is home to several important nesting sites for four different species of turtle: the endangered Green Turtle, the Olive Ridley Turtle, the Loggerhead Turtle, and the critically endangered Hawksbill Turtle. Not known to many, the best time to travel and see the turtle hatching is during summer time, between May and September. Being in the Middle East and understandably so, there is always that hesitation in traveling due to the temperature and humidity. Wired internet is available in public areas and costs OMR 1 per hour. House Rules Ras Al Jinz Turtle Reserve takes special requests – add in the next step! One older child or adult is charged OMR 15 per person per night in an extra bed. Ras Al Jinz Turtle Reserve accepts these cards and reserves the right to temporarily hold an amount prior to arrival. Fantastic to stat in the tent camp. Very good guides on the Tour to the turtles. We were lucky to see more turtles on the beach. The dinner was very good but rather expensive compared to local prices. The reserve accepts many outside visitors, Our guide said that 500-600 on a weekend evening is normal. I think the reserve has responded to some of the on-line criticism of poor guest behaviour around the turtles, but the experience is a bit of a circus. Good to get 2 trips to see the turtles included. Buffet for both supper & breakfast more than adequate, although quite functional. The facilities are terrible (room full of flies, bad smell). No food option after the evening tour and only very average and expensive buffet before. They are bringing hundreds of people to see a few turtles every evening and morning, does not seem environmental friendly at all. Can't see how turtles will keep on coming with such harassment from tourists. We were lucky to see a turtle laying its eggs, amazing experience! Needs a little more attention to utilities. We had burnt our light bulbs and outlets. They tents are an awesome touch! In one of the rooms there was a bad smell from the sewage. No internet access in our rooms which were locate outside of the main building. Friendly staff and turtle watching tour. The distance to the beach and the hotel is very basic. There is no food served after 9 pm. Nice room, sink with wide shelf. The resort is next to The beach but you Will walk less than 15 minute to reach it (nice landscape). Nobody is allowed to the beach afyer 4. 2 turtle tours included. Good breakfast. The hotel was run down and overpriced for what it is. The restaurant is overpriced and mediocre, but there are no decent options to eat nearby. The room is tired. The whole place needs a deep clean inside and out. The place has a lot of potential, but sadly, as it is now, we would not want to stay a second night there. The turtle viewing tours were the only reason we stayed at the hotel and both the evening and morning tour were fantastic, even though overcrowded! Although we were out of season, we saw a turtle laying eggs and even a baby one making its way to the sea. Bathroom/shower facilities were really poor. Very surprised. Aircon bad and noisy. The turtle experience is an obvious draw. Very helpful staff. Like most things in Oman the hotel is spotlessly clean. Good breakfast. There should be some children's facilities - slide or swing or trampoline because for them is boring the wait all evening for the turtles. The location is fantastic- very remote and calming down. The food (buffet) was also great! Congratulations to the chef cook. The night visit of the turtle at the beach caused mixed feelings. Way too many people walked to the sea shore to see a turtle laying eggs. It was noisy, people did use flash lights. Unimaginable that turtles are not disturbed. Same when the groups watched a little turtle baby approaching the shore, bright light and people around the baby made it marching backwards. On the way back to Hotel, another unoriented baby turtle was seen, people almost stepped on it. Please ask for a fee between 50 and 100 OR, this will bring only really interested people to this special event. Everything went well. Room was good, quiet and clean. Hard to understand the English of person at reception. We stayed in an eco tent which was OK - but tents in African game parks are better. Restaurant was limited. Hotel rooms are dated and face wrong way. Hotel needs rebuilding with full facilities including pool and visitor centre - maybe like the Anantara!